Squirrels sound off to tell each other about danger. These small mammals are defenseless against many predators, including cats, hawks, lynxes and human beings. Staying alert, vocalizing -- including a sound that's like a meow -- and being speedy give squirrels their essential advantages for surviving environments teeming with squirrel eaters. More than 200 species live all over the planet. Australia is the only continent lacking a squirrel population. This diverse group of rodents includes giant squirrels, pigmy squirrels, ground squirrels that burrow underground, tree squirrels that leap from tree to tree and flying squirrels who glide from branch to branch like fleshy kites. Depending on the species, an adult squirrel may be smaller than the length of your hand from nose to tail tip -- or more than 3 feet long in the case of the Indian giant squirrel. Researchers have names for the sounds squirrels make. Biologist Robert Lishak, an expert on gray squirrel vocalizations, says that squirrels communicate with each other and with other animals, too, the "Wall Street Journal" reports. Baby squirrels make a noise like a soft sneeze, called a muk muk, to say they need to nurse. The "kuk" expresses alarm. 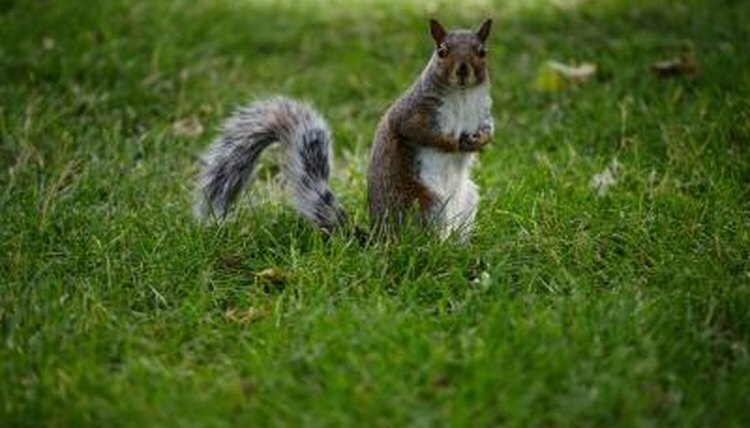 The loud, repeated sound helps other squirrels locate the threat and lets the predator know the squirrels are onto him. The "quaa," a prolonged kuk similar to a cat screech, says the threat's diminishing but still near. Gray squirrels utter a meow at the end of a quaa moan, according to Lishak. The quaa moan indicates a lower threat status than the quaa. This chirp-meow combination tells others the threat may be gone, but it may not be all-clear yet. The sound is softer than the kuk alarm signal and makes it difficult for a predator to locate the squirrel. By observing the activity when a squirrel meows, you'll be able to understand how squirrels keep each other safe with their threat reports. When a cat leaves the yard, a squirrel will let others know with a chirp-meow. That meow might not be a squirrel's. Steller's jay, a blue jay with a black crest, mimics other birds and animals -- including squirrels -- as do mockingbirds. To identify the source of the meow, keep field glasses on hand to get a better look. A squirrel turns her body toward the intruder. Check where she's looking to identify what triggered her to sound off. In mating season, male squirrels chase females making the sneeze sound similar to the sound baby squirrels make to ask for food. This pickup ploy says he's harmless and only wants a date, Lishak says.